Trip Report: Moab and the Green River Meet-Up. Saturday, September 20, through Monday, September 29. Five years. Who would have thought we would repeat our meet-up in the desert southwest for a fifth time. Well, I reckon it really is not a surprise when you think about it. I mean we all just hit it off so well in Bluff back in the fall of 2010 and the event has just grown since then. Bluff, Kanab, Moab, Escalante and now Green River; those points on the map now have a particularly special meaning for the cats in this herd. 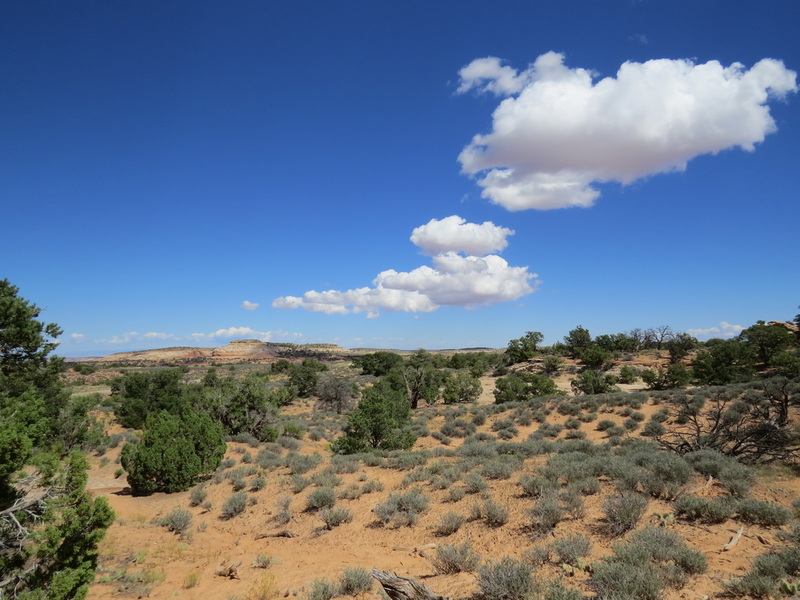 Planning for this trip started in early October, 2013, while we were still in Escalante. We were already talking locations and dates for the 2014 meet-up. Sedona and Green River had most of the buzz and after a few Doodle polls we had locked in Green River and the dates for the 2014 meet-up as well as confirmed Sedona as the location for our 2015 event. That’s pretty good for a herd of cats like our group! Lynn and I figured that since we were going to be so close to one of our favorite destinations in southern Utah, that we should tack on few days in Moab. So after weighing our options and looking at VRBO lodging (more on that later), we decided to add time ahead of the meet-up to explore around Moab. Somewhere in the mix Lynn’s sister Lisa was added to the passenger manifest. We had to scramble a bit for her lodging. She got two of the four nights in the same VRBO complex that we had and stayed the other two in a Moab motel. 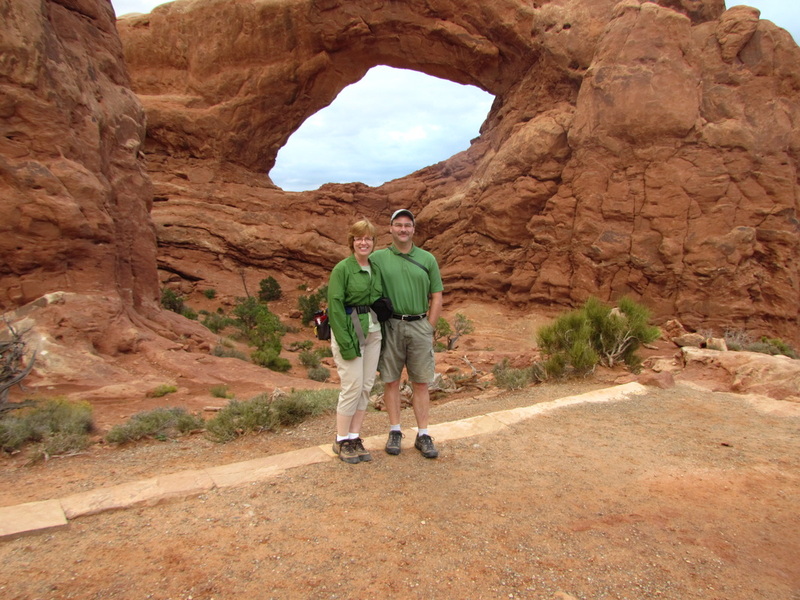 So while this would be our fourth visit to Moab, there was still plenty to see and do that would be new for us, plus there were some things that we would repeat so that Lisa could enjoy them. As for the meet-up, Danny was taking point for the excursions, Pixie had some local hikes in mind plus secured a venue for the group cook-out and Howie, Max and Alex coordinated the cook-out logistics. All the rest of us had to do was show up. This has been a busy travel year for me, with 14 trips since the start of the year, and 11 of those since the middle of April. Most of that travel was for business, but Lynn and I did have our share of fun trips this year with four summertime excursions, an unusually high number for us (road trip to the Smokies with Mom, Grand Teton and Yellowstone for my 50th birthday, Sequoia National Park for a back country adventure and now Utah for the meet-up). Even with the hectic schedule, it is still fun to travel (well, sans the air travel, that’s not so much fun anymore, but it is still the best way to cover these long distances). The meet-up trip is the last one on the schedule for 2014, so now I can catch up on the photos and trip journals and start planning for the next set of trips. Day 2 - Devils Garden. Day 3 - New Arches. Day 4 - Arches and Canyonlands. Day 5 - On to Green River. Day 6 - Horseshoe Canyon. Day 7 - Little Wild Horse. Day 8 - Nine Mile Canyon. Day 9 - Rainy Day in Moab. There is also a summary page of the hikes that we completed as well as the critters that we saw during the trip. Getting ready to get ready… Vacation started for me on Thursday evening, even though we did not leave until Saturday morning. I had already planned on taking Friday off to finish packing and to do any last minute chores around the house. Fortunately, the grass had finally slowed down, so there was no need to mow and most of the packing had been taken care of last weekend, so it was just a matter of completing the checklist for the trip prep (key for the critter sitter…CHECK) and then just easing into vacation mode. The text and email notifications for the flights are coming in now. The Cleveland to Denver flight is still listed as on time, but the hop from Denver to Grand Junction is already shown as a 15 minute delay. That’s actually a good thing as we only have about an hour to make the connection and Lisa’s connection time is even shorter so a little cushion on the schedule helps. While we had a general plan for the trip, with four nights in Moab then five in Green River for the meet-up, we left the overall details a little vague and thought we’d just go with the flow. Granted I had a list of things to see and do that included several hikes that we had not tried before, so there would be no shortage of activities. No doubt we would cover a lot of ground including a lot of new territory, and that is exactly what we did, as the map below shows. Corona Arch, False Kiva, Horseshoe Canyon and Little Wild Horse Canyon were all high on the priority list, but I really did not know how many we would do during the trip since we were working with the rest of the herd as well as Mother Nature (weather became a concern as we got closer to the trip with rain in the forecast for the meet-up weekend). But as you’ll see, we got to do all the hikes on the priority list plus a lot more. 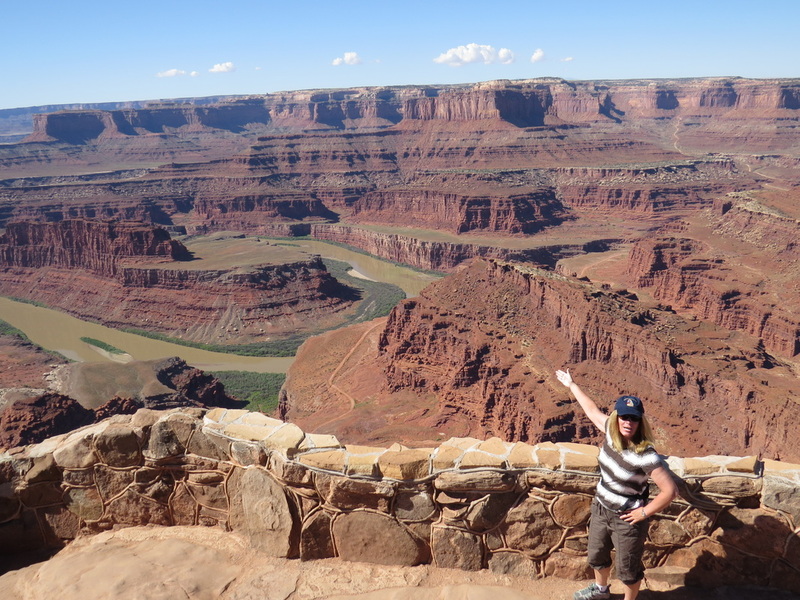 The roads we traveled and the main points-of-interest we visited during our 2014 trip to Utah. ﻿Day 1 – Saturday, September 20: Heading to Moab.﻿ Up at 0500, just like a work day, and on the road to the airport at 6:30. It took us exactly an hour from the time we left the house to get through security at Hopkins. That has to be a record! No traffic and no hassles with check-in throughout the process. The short lines certainly helped with expediency, but the lack of crowds is not a good thing for the health of the airport. It was a bit of a ghost town in some areas of the terminal. But I’m on vacation, so no time for those dismal thoughts. We hit up Einstein Brothers for a bagel. OK, I’ll go with the seasonal offering and get the pumpkin, lightly toasted with butter, please. Not bad. We finished our breakfast and headed to the gate, arriving well ahead of the boarding time. No issues at all with the flight. We actually arrived in Denver early, so we had time to find a snack, but all the sandwich places had a line out the door. We even tried Heidi’s way out at the end of Terminal B but that was a zoo as well. We finally gave up and just got some crackers and Flipz from Hudson news. Then we headed back to our departure gate where we found Lisa. So far the plan is working out well. Our departure was basically back to "on time" as the schedule was readjusted back closer to the original time. Lisa snagged an upgrade to first class, not that it got her much on a regional turboprop; still, it’s the thought that counts. It was a very quick flight to Grand Junction with lovely scenery on approach and a pretty much an on time arrival at about 12:30. It took a while for luggage to arrive at baggage claim, so I had time to get the car sorted. I had to call Priceline to find out which company I rented from as that information was not included when I uploaded the confirmation email to TripIt; lesson learned there. After working through about 20 phone menus, I finally got the one piece of data that was missing: Avis! I had the car in about 48 seconds after that. By this time the luggage was finally on the carousel. We were loaded up in our black Ford Explorer and on the road westward at 1:00. I’m really enjoying the simplicity of this small, regional airports. We knew it was going to be hot when we got to Utah, and it was. The temperature reading on the Explorer was heading well into the 90s. But we had the AC going, so no worries. Just sit back and enjoy the views. Along the way, Lynn explained the “critter count” to Lisa. The first critter we encountered was a raven along the roadside. Lisa did not think that ravens should count as they are so common, but Lynn’s game, so Lynn’s rules. We did get into more local animal sightings very soon, as we saw a large herd of pronghorn along the north side of I-70. I reckon there were 30 or more animals in the herd. That's bigger than what we saw in Yellowstone. Of course we took scenic route 128 into Moab, exiting I-70 at Danish Flats. 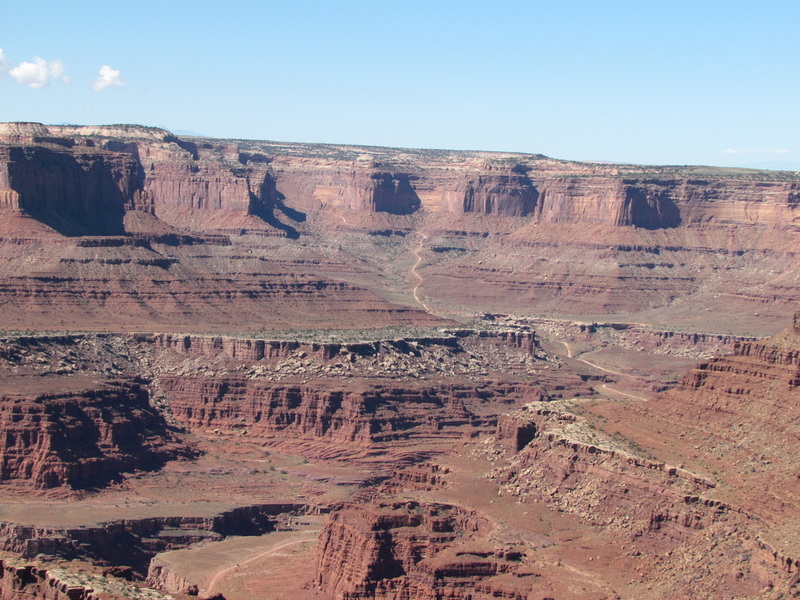 This is a very pretty drive, particularly the stretch between the old Dewey Bridge and Moab. It is a bit of a winding road, and parts of it are rather narrow, but the views are amazing. At this time of day, the best views were behind us due to the light. Then there was the extra color from all the wildflowers. Plus there was a lot of activity in the river with all the rafters, kayakers and even a couple folks on paddleboards. We also got our second big critter sighting of the day, with a coyote along the road side near the Sorrel Ranch horse pasture. The directions to Cliffrose Flat were dead on and we pulled into the small parking lot right at 3:00; perfect timing for check-in. Lynn and I were in the Paradox unit and Lisa was just next door. Wow, this is a very nice place! Great location and the perfect size for two people. The Paradox unit has a good size living area and kitchen in one room, a nice size bedroom and a very nice bathroom with a walk-in shower. Off the back of the unit is a covered patio. The location is ideal as we are just a block off of the main drag in the middle of the business area, so close enough to walk to the shops and restaurants but far enough away for some peace and quiet. I can see this being our regular place to stay when in Moab. Next on the list was a supply run to the grocery store for breakfast food and snacks and the State Store for some beer and wine. By now it was 4:00 so we decided that dinner was in order. Unfortunately, the Desert Bistro does not open until 5:30, so we just figured we would walk up to the main drag and try Miguel’s Baja Grill. Well that was a good idea until we got that and found out that it does not open until 5:00. What’s up with that? So we had 45 minutes to shop…joy (did you catch the sarcasm?) Well, Lynn hit her favorite shops, so maybe we’re done with that for the trip. At least it is mostly shaded along the streets and it is cooler inside the shops, as it is 96 degrees F here in Moab. So after our quick lap through several of the shops, we were back at Miguel’s right at 5:00. Good thing as the place was already filling up, but we were seated right away and ordered a round of margaritas. Not bad. The chips and salsa were also good, although way over on the mild side. The service was great. Our orders were taken quickly and our food was out no time at all. Lynn had the steak fajitas, Lisa the chicken quesadilla and I had the chili relleno with shrimp which was the special for tonight (I was going to go for the MOAB, but the beans of the day were refried so not an appetizing choice). We all enjoyed our meals, but the food was just good, not outstanding (review). After dinner we hit a few more shops. The best of the shops in my opinion is of course the Tim Till gallery. His landscape photography images are simply awesome. We opted out of Arches for the evening. The original plan was to hike to Delicate Arch for sunset, but we were already tired and we wanted to get an early start tomorrow. So instead we tried out the upstairs terrace at Cliffrose enjoying a beer and the sunset. It wasn't a glorious sunset, but it was still a nice way to end our first day in the desert southwest. Hmmm, the only photos I took today were of the sunset with the phone. Once the sun went down, we went back to Paradox and watched a couple “Big Bang Theory” reruns, then crashed at 9:00. Sort of a whirlwind day, but we'll be ready for some desert adventures come tomorrow morning. Moab sunset at the end of our first day. 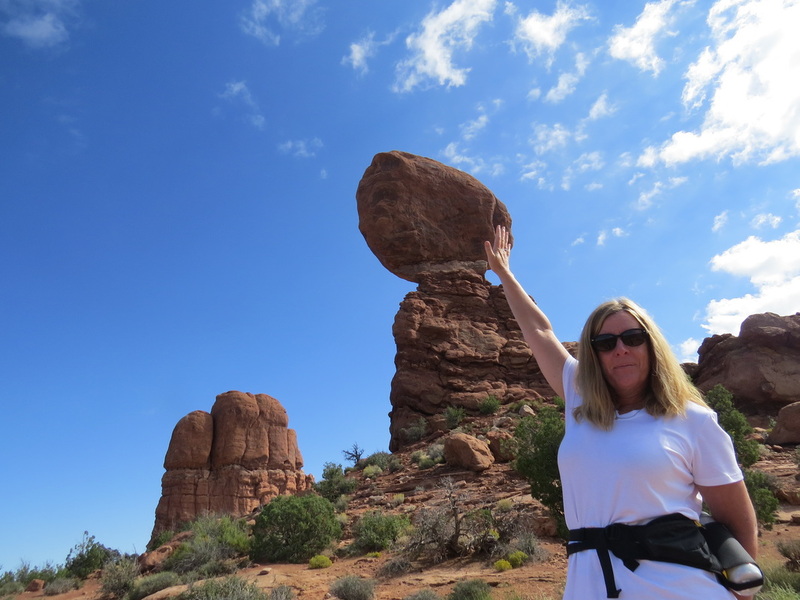 Day 2 – Sunday, September 21: Devil’s Garden. We’ll still on east coast time, so no surprise I was awake early, but I catnapped until about 5:00 then rolled out of bed. Feeling pretty good. Always a concern when sleeping in a new place, will the mattress be comfortable. This one was. We had a bagel for breakfast then got our hiking gear in order. The plan for today is to head to Arches with no specific itinerary; we’ll just go and see where the spirit moves us. We were on the road toward Arches at 6:50, just going to play it by ear. My starting thought was to check out the Windows, but the light was really bad, so we skipped that and headed to the end of the road and the Devils Garden. This is the third time that we have hiked the Devils Garden. It is one of my favorite day hikes in the National Parks System. It is a good challenge, but not overly difficult. And best of all, there is beautiful scenery along every step of the trail. Plus the character of the trail changes several times throughout the loop, so there is good variety throughout the hike. But this is the earliest that we have reached the trailhead and this point made a big difference. First of all, we found a parking spot! In the past we probably arrived mid to late morning and the place was packed, so we had to park on the shoulder along the access road. Of course that is not a problem now as the Park Service has added a lot of parking along the access loop which is a good thing. But today when we arrived there were only a dozen or so cars in the lot, if that many. The second key point is that an early start means that we are beating the heat of the day (90-plus predicted) as well the afternoon thunderstorms that are in the forecast. Right now it is slightly overcast and very pleasant for hiking; probably in the 60s this morning. Our track through the Devil's Garden. Due to the overcast photos at Pine Tree and even Landscape Arch were just OK, but the sight of these arches was still magnificent. But once we were past Navajo Arch, we had great light and my kind of palette; the multiple hues of the desert rocks, the blue sky and the white clouds…I just think that this is the best!. Even after the sky broke up and the sun peaked out, there was still a nice breeze so we were very comfortable throughout the hike. 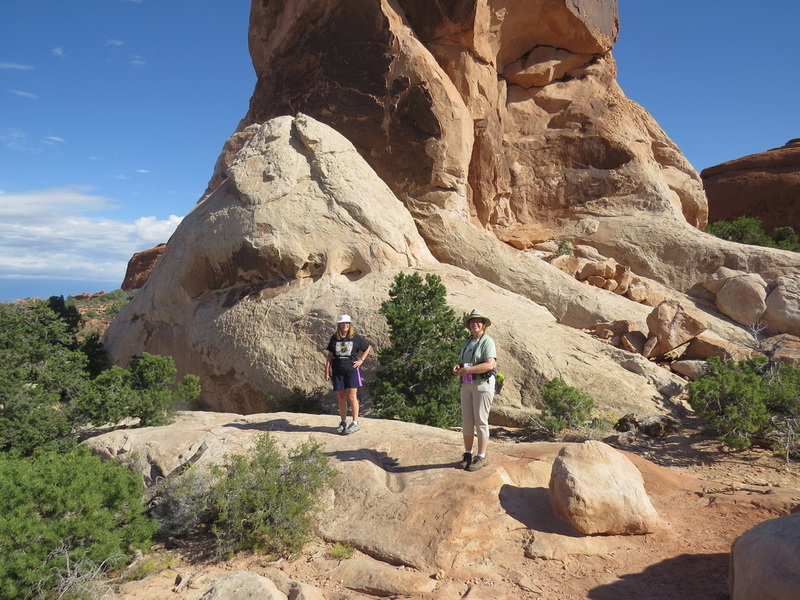 We hiked the main trail out to Double O Arch then continued around the primitive trail plus we did all the spur trails to the various points-of-interest around the loop. There are several areas along this route that I think are just really cool. Obviously Landscape Arch is a highlight. At 306 feet this is the longest span in the park as well as the longest on the planet (OK, the signage in the park indicated 306 feet but surveys by the Natural Arch and Bridge Society put the span at 290 feet. Whatever the measurement is, this is an amazing natural wonder). View approaching Landscape Arch. Still a bit overcast, but the blue sky is starting to peak through the clouds. I also like the walk up the fin where Wall Arch used to stand and the views from Partition Arch which is adjacent to Landscape Arch. I walked beyond Partition Arch a bit to see if there was much of a view of Landscape Arch from the backside; not really. Then I walked through Partition to get a better view of the vista; now that was truly impressive. Still a little subdued due to the overcast, but the sun was starting to break through. It is just a nice overview of the desert landscape from this vantage point. 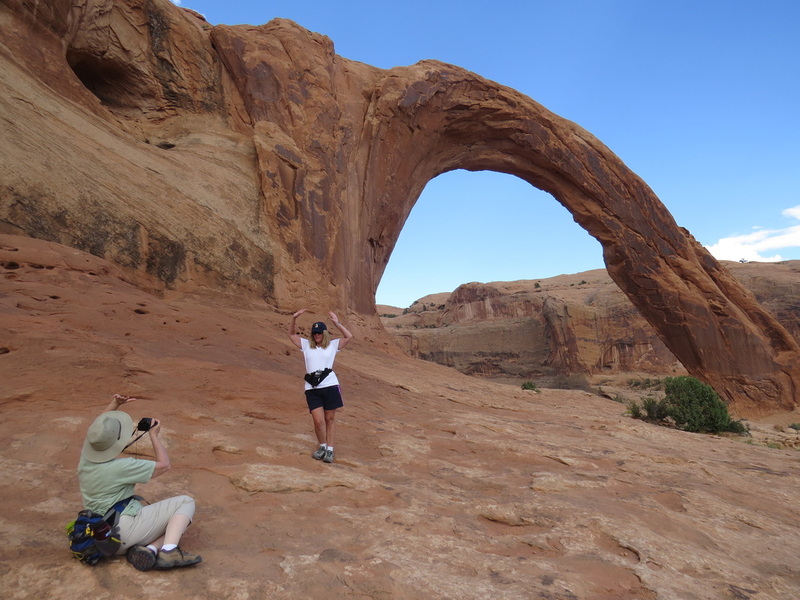 We noted a new fad on the spur leading to Navajo Arch. The sandstone fin adjacent to this spur bears a lot of erosion which forms a series of holes and shelves in the rock. Folks must have thought that these shelves would have a great curio cabinet as there were hundreds of little rock cairns and other "sculptures" built on the shelves and other openings in the fin. Sort of like Buddha Beach near Red Rock Crossing in Sedona. I think Lisa added a small cairn to the collection. Interesting phenomenon; perhaps the tourists just feel that they need to leave their mark. I reckon these are not hurting anything and they could be removed if the Park Service deemed them an issue. Certainly not a permanent scar, like scratching initials in the rock like some morons feel that they have to do. (Trust me, nobody cares that “Johnny was here” or that “AJ luvs TC”). The vista looking out from Partition Arch. The "Cairn Wall" along the spur to Navajo Arch. The part of the trail that runs along the back of a side sandstone fin between the Navajo Arch spur and Double O Arch is always a highlight as there are wonderful views in all directions; to the east out over the maze of fins and to the west over Salt Flats and Klondike Bluff. There was quite a bit of wind today when we got to this exposed part of the trial. Fortunately the fin is very wide so there is no real danger of falling, but the wind did add a little excitement. This trip the clouds provided extra interest to the vistas from this section of the trail as well. Lynn and Lisa add some scale to the immense vista from the back of the sandstone fin leading toward Double O Arch. Double O is the end of the primary trail, and seems to be the end of the trail for most visitors. While we were earlier arriving at Double O than on our past hikes, there was still a decent crowd milling about, including the guided hike of a dozen or so Europeans who we have been following around this morning. They obviously got an even earlier start today. Anyway, Double O is another of many amazing arches in the park. A bonus of getting here a little earlier is that the sun is not directly in your eyes (or camera lens) when you first see the arch. Lisa and I climbed through the lower opening and scrambled up to the view point on the far side of the arch. 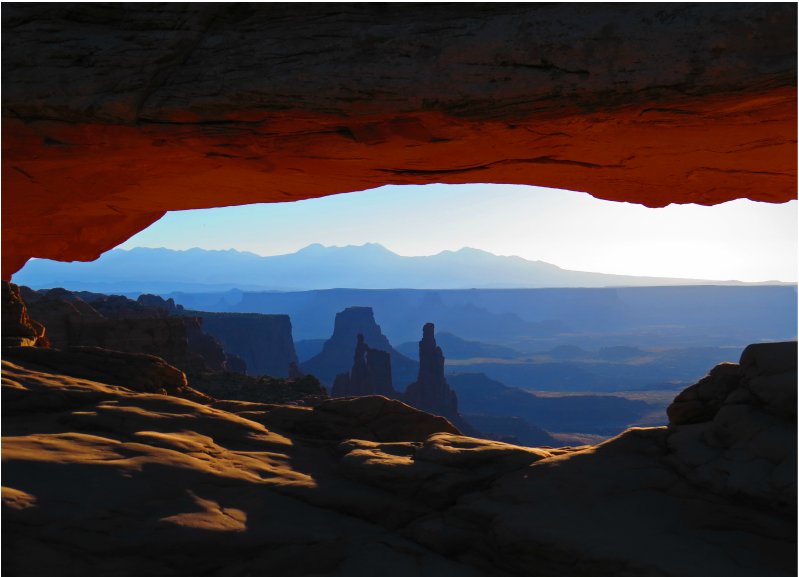 This is where you can get a nice view back through Double O, using the arch as a frame for the desert landscape beyond. Now here is where we saw our first stupid person trick of the trip (and there would be others), as we witnessed not one but two hikers scale Double O and walk along its span. That is a pretty high perch and the wind we experienced along the fin would certainly increase the level of difficulty, but these two young mountain goats seemed to handle it well. I talked to one of the climbers when he came down and he said that the wind was not an issue and that the scramble up was very easy. However, I later learned that it is illegal to climb on the named arches in the park, so stay off for your own safety and to preserve the natural wonders. Unlike our previous two hikes through the Devils Garden, this time we took the spur out to the varnish covered obelisk known as Dark Angel. So glad that we did as there are great views out over the Salt Flats and Klondike Bluff plus the close in views of Dark Angel provide some interesting photographic opportunities. 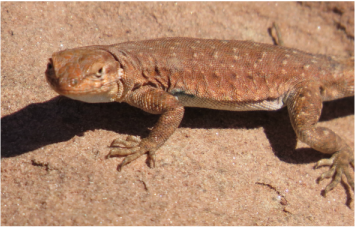 Plus we got our first good view of a good size yellow-spotted lizard, who kindly posed for a few photos. 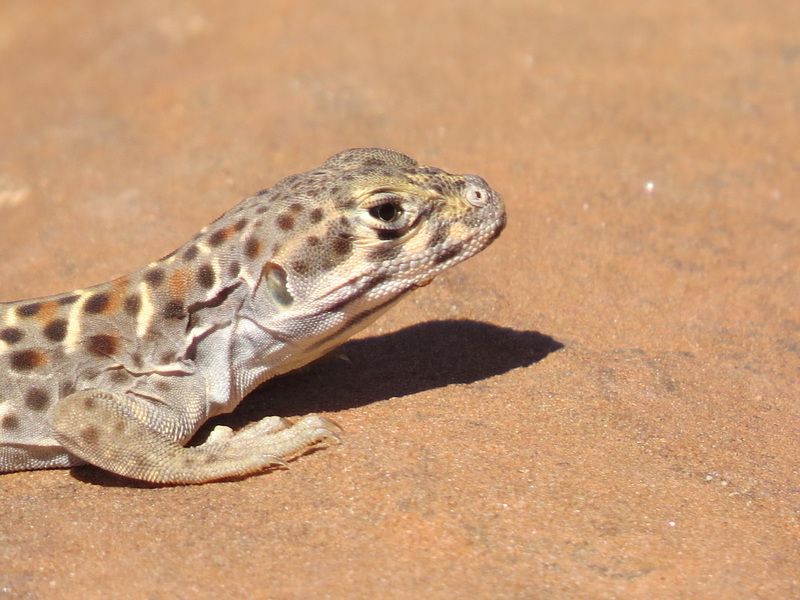 It was our first sighting of a blunt-nosed leopard lizard. So on to the primitive trail. I really enjoy hiking around and over the fins through this part of the trail. The trail covers a lot of different terrain; through sandy washes, along the fins and up and over the fins. There is some scrambling involved, but nothing very technical and the trail is fairly well marked with cairns. We included the spur out to Private Arch as well. This “short” spur was longer than indicated on the trail guide, but is still worth the hike. The arch is cut right out of a fin, so it provides a great example of how the arches form. I did walk along the back of the fin that contains the arch; this was before I knew that walking on the named arches was verboten. We saw a few more critters along this little spur; another leopard lizard and a very friendly chipmunk. After Private Arch we continued on along the primitive trail, working our way through the fins and washes. All was well until we rounded a turn and met an older couple in the trail. They seemed a little lost and I quickly saw why. The trail at this point was in the wash and worked through a short section between two sandstone fins, forming a channel with sort of steep walls. The problem was that the wash was flooded; there was a pool filling the wash and it looked fairly deep. The gentleman had looked for alternative routes around the fins, to no avail. They were deciding whether to turn back when we came along. I looked at the situation and it looked like I could make it around the pool going along the left on the slickrock. OK, let's hope the tread on my boots has good grip because I'm not looking forward to a dip in the pool. It was actually much easier than it looked. I must have been paying some attention during all the time following Rick, Howie and Oscar across slickrock, as I was able to quickly negotiate my way to the other wide of the pool. I was able to coach Lynn and Lisa across as well, but I did have to give them a pull to get them up the last steep bit, then I helped the older couple and finally a young German couple who showed up while we were making the crossing. But we all made it and we all stayed dry. Hey, it was not a big obstacle, but we all felt pretty good with our little bit of canyoneering. No other issues, other than some deep sand, for the remainder of the hike. The fins along the end of the primitive trail remind me of rows of old streamlined steam locomotives in a huge train yard (like the old “J” class from the Norfolk and Western or the engines that drove the 20th Century Limited for the New York Central). There is one final set that looks like a row of submarines. It’s fun to let your imagination run wild; sort of like seeing animals in the clouds, there are plenty of things to see in the rocks as well. We were back at the trailhead at 1:00; right at five hours to complete the entire loop and all the spurs which adds up to about 8.3 miles. Not too bad for our first hike. Here's the link to the review and the track on Ramblr just for completeness. On the drive out of the park we could see rain off to the southwest, more or less over Canyonlands. Since the weather seemed to be turning sour, we decided to head home for cheeses and crackers on the patio so we could see how the rest of the day turned out. Good choice as it poured from 2:00 to 4:00. But we had a nice relaxed afternoon and also saw a few more birds: Common Flicker (red-shafted race), Ravens, Magpie and a flyover by a couple of Sandhill Cranes. The girls liked the Castle Creek Chenin Blanc and I had a couple Unita Brewing Company beers – Detour DIPA and a Hop Nosh IPA. We hung-out on the patio until 3:45 then started making plans and getting ready for dinner (that shower felt soooo good; love hiking in the red dirt but it is great to wash it away as well!). We made reservations at Desert Bistro for 5:30. 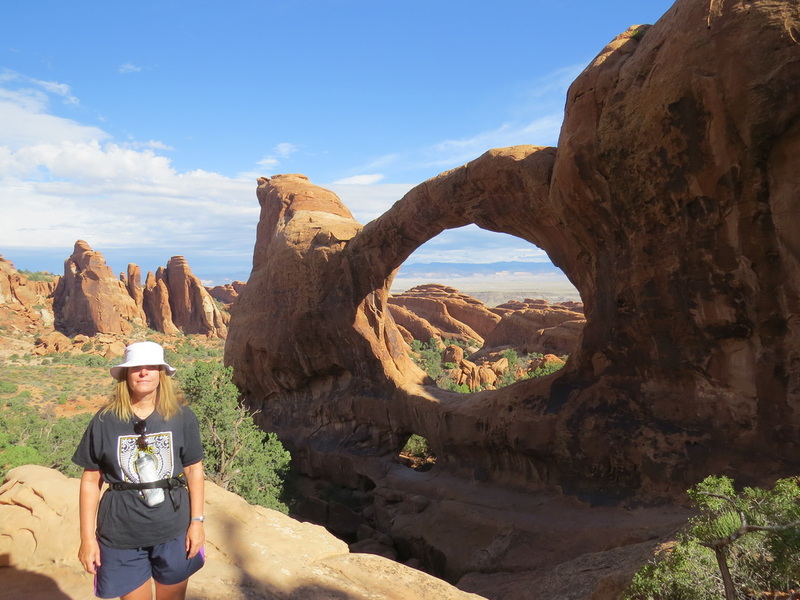 Lisa at Double O Arch. Lisa and Lynn at the base of the Dark Angel. At the end of the spur trail to Private Arch. Back at the house, Lynn found a Miss Marple on Masterpiece Mystery; I watched the first one but opted out of the double-feature and hit the sack at 9:00. Here's the link to the photos from our hike through the Devils Garden. Day 3 – Monday, September 22: "New" Arches. Up at 4:30 but we were not on the road until 7:00. Lisa got her chuckle for the morning pointing out that Lynn and I were dressed nearly alike. This happens a lot, but we had not noticed. Plan is to head back to Arches and try the Windows area again if the light is good, then we’ll hit Sand Dune Arch and Skyline Arch. On the way to Arches the overcast made us none too hopeful, but the skies were trying to clear once we were on the park road. The glow on the Great Wall was spectacular! I really had to fight the urge to stop for photos, but we wanted to show Lisa the Windows section bathed in all its glory. When we pulled into the windows lot (which had 8 cars and no buses) the sun was on the rocks over by Double Arch, so we had hope. But by the time we got our gear and were starting up the trail, the clouds were again winning. We still looked around the area a bit. The area is still beautiful even without the perfect light. But with the lack of the morning glow, it was best to move on to new territory. Lynn and me wearing green at The South Window. Our next stop was the trailhead for Sand Dune Arch. We’ve driven past this smallish parking area numerous times but never stopped, probably due to the crowds. Well that was our loss. We were much earlier in the day than our previous visits, so there was only one other car in the lot when we arrive at 8:20. We quickly got our day packs on and headed to the trail. There was a marker at the trailhead that showed the route of this lollipop trail. Three miles; just s nice stretch of the legs. But it was a bit chilly this morning as the overcast hid the warming rays of the sun. Jackets or not? It’s bound to warm up quickly so I opted not. Tracks of our hikes in Arches this morning. Heading across the open trail toward Broken Arch. Interesting clouds over the fins containing Sand Dune Arch. 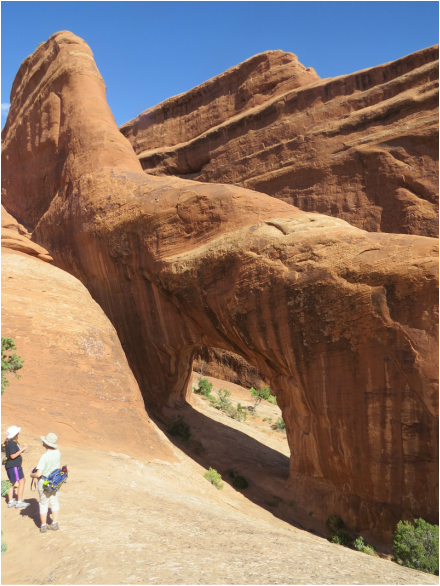 The first stop on the trail is Sand Dune Arch, hidden in the fins just a tenth of a mile from the trailhead. To get to the arch is another tenth of a mile along a narrow gap between the fins. The sand is a little deep in places but not too difficult. The arch is tucked back off to the right from the trail between the fins. It is not a huge arch, but it does have a nice contour. There is also what appears to be the remains of an fallen arch (the ends of the old arch in the fin next to Sand Dune). Just more evidence to the ever changing nature of Arches National Park. 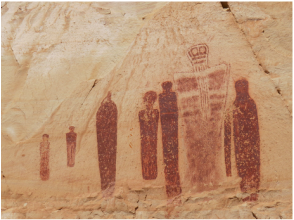 Of course other evidence to changes in the park was the barricade just to the south of Sand Dune Arch to keep the tourists from further damaging the that area with carved graffiti. C’mon people, use your heads. So back out to the main trail, we headed across an open field, marching toward the distance set of fins that house Broken Arch. The wildflowers were awesome along this stretch of the trail and the views all around were outstanding. The fins in front of us were getting the morning light, well at least part of the time and the sun and clouds were still fighting for control of the sky. The fins behind us were more in shadow but had some interesting light play as well with the sun trying to sneak through. But in addition to the good light I was also glad that it was morning for the cool temperatures as this part of the trail is completely exposed. While it makes for great views, but I bet could be brutal on a hot afternoon. Broken Arch was visible at the far right of the collection of fins we were approaching. Once we reached the fins, the trail worked along the edge of the rock toward the arch. We got some interesting up close views of the fins and other formations as well as a few small critter sightings. There was a cottontail in the trail; Lisa was on point and sort of froze when she saw it and waved to us to be quiet. I thought she had spotted a bobcat or something. Plus the place was infested with chipmunks; those little dudes were all over the area. We reached Broken Arch about ten ‘til nine. Quite an impressive sandstone sculpture. There were a few little pools of water in the slickrock from the rain yesterday, but none were positioned in such a way to provide an interesting reflection shot (in fact there were other puddles scattered along the trail, but nothing that provided any photographic interest…at least not that I could see). But the arch itself made a great frame for the landscape back to the south. We enjoyed the views from around the arch for a few minutes, then continued on around the loop. All along the trail we had noticed hoof prints, either mule deer or pronghorn. We found more tracks along the trail beyond Broken Arch. We also met a couple of ladies also looking at the tracks and seemingly trying to follow them to see if they could identify the animal. We mentioned that we thought the tracks were pronghorn but they insisted that they were made by a mule deer. No way to know I reckon as we never saw either. There were nice views along the trail, with a few sandstone monuments along the trail and bigger vistas off to the north where the red rocks were capped by a lighter colored layer of stone. The rocks in that area were domed; sort of reminded me of old churches. The trail alternated between slickrock and sand and had a bit of a roll to it as we worked through a couple of gullies. 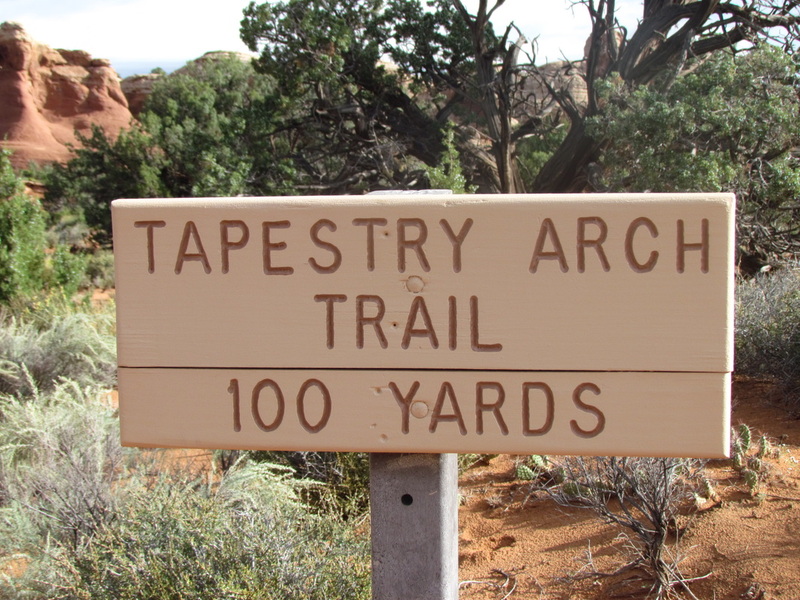 Then we got a little surprise as there was a sign stating that the trail to Tapestry Arch was another 100 yards down the trail. 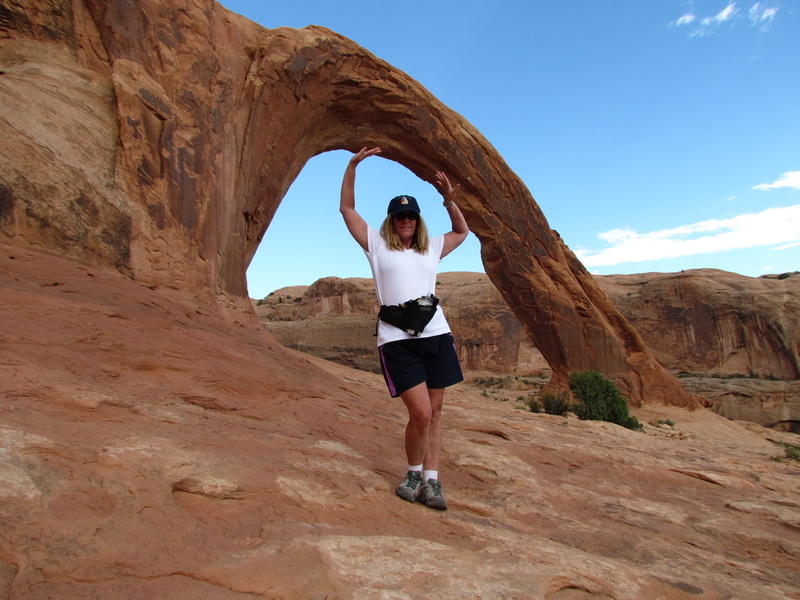 Well, we did not know there was another major arch on the trail, so we got a bit of a bonus. Now that we knew where to look, we could now see the arch off in the distance, out among the church domes. Well, let’s find that trail and check it out. The sign was well placed, as this would appear to be a good place to head across the desert to reach the arch, but the marked spur was the better way to go as it is the established trail and therefore should reduce the impact to the area. Hiking along the slickrock between Broken Arch and Tapestry Arch. The spur trail was pretty easy except for the one point where there was a big juniper bush sort of hanging across the wash. The girls stayed in the wash and worked around the tree while I took the high road and scrambled up on the slickrock bench, where the next set of cairns were located. Nice view of Tapestry Arch from this point. We cruised on over the slickrock, down through the next wash and back up on the sandstone to the arch. I climbed up onto the shelf below the arch, but that was as far as I could go as there was no access beyond the arch. Nice views from up there though, plus I worked around to get a glimpse up the adjacent canyon. We were right in the midst of the dark red rocks with the tan domes. Tapestry Arch as seen from the spur trail. We retraced our steps back to the main loop then moved on to the campground. How convenient, the trail enters the campground right next to the outhouse. Good timing. So we took a little break and read the signage which provides information on the trail including good directions to the point where the trail exits the campground (over near campsite 51, I think it was). I reckon it was about 9:45 by the time we left the campground. To this point, we had seen three other people on the trail (the two ladies looking at the animal tracks and a guy we passed on our way back from Tapestry Arch). The trail started to climb once we exited the campground. Nothing major in terms of difficultly, but it was uphill. But that was OK as the vistas from the high ground were some of the best along the trail. Nice view looking back out over Tapestry Arch with the some interesting cloud formations as a backdrop. Then we dropped back down into the sandstone fins and through the narrow, downhill passages. This was another sort of interesting little section of the trail, walking through the tall fins and spires, but the lighting was not the greatest as we were heading back into the sun. 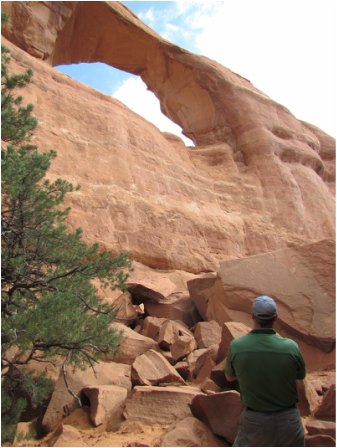 We soon broke out of the sandstone fins and back into the open expanse between Broken Arch and Sand Dune Arch. There were a few more folks on the trail now, but still it was not crowded. I played around with trying to get a few shots with the wildflowers in the foreground and the sandstone outcroppings as a backdrop. Not sure that I did any good, but it is fun to experiment. I reckon we were back at the trailhead a little before 10:00, so not quite two hours to complete the loop. But this was a gem of a hike. 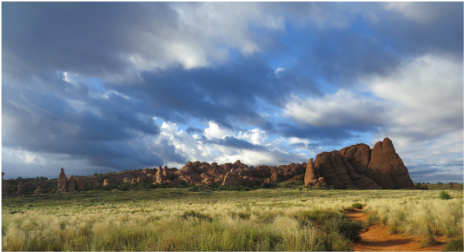 It does not get the attention that the Fiery Furnace, Devils Garden or Delicate Arch get, but it is certainly worth the effort. You know, it is sort of an easier version of the Devils Garden. It is much less than half the distance and takes much less time and is an easier trail, but it offers three great arches and some great views all along the trail. Maybe this is a good option for folks who are not up for the longer and more challenging primitive trail through the Devils Garden. The trailhead parking lot was not packed when we returned but it was certainly a lot more crowded than when we arrived two hours ago. Early start, that’s the way to go. Here's the review for the hike and the Ramblr track. View along the high ground south of the campground. Since we were covering new ground this morning, we figured we should take in Skyline Arch as well, seeing as we have not made that short walk before. We made the short drive north along the park road to the pullout and were fortunate to find a place to park. The place was mobbed at 10:30 (remember what I said about an early start!). But I found a place to squeeze the Explorer in and we hopped out to check the views. Skyline Arch is clearly visible from the parking area, and I think the best views are just a bit further up along the trail, sort of the high point where you can take in the arch in the entire fin in which it resides. We read the signage about the huge boulder that fell out of the arch about in 1940, the debris of which still lies below the arch, so that gave us another reason to take the short walk to the base of the arch. 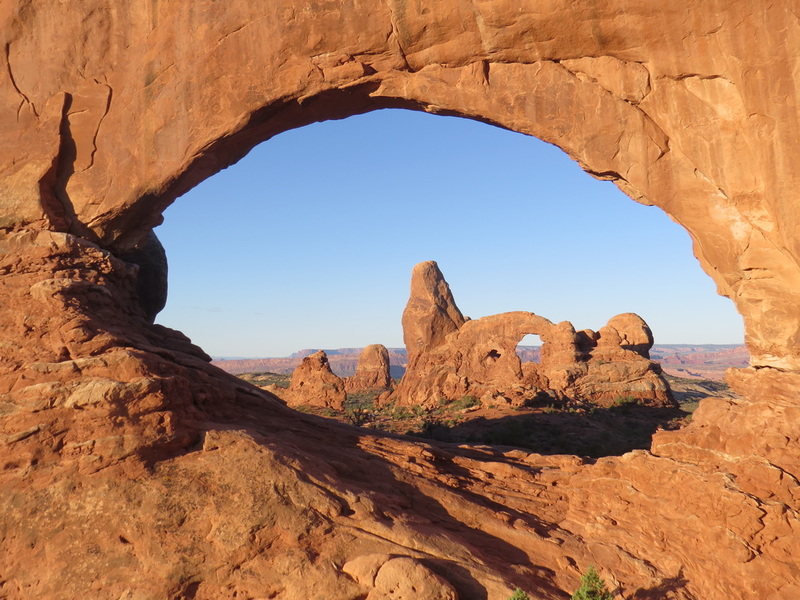 Like most of the named arches in the park, Skyline’s moniker is well suited for this natural wonder. The arch is along the top edge of the tall fin, so certainly part of the skyline of the park. 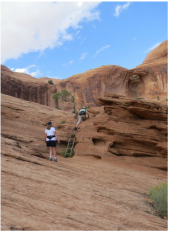 The trail to the arch is flat and over sandy terrain, but overall easy. Some of the folks we passed on the way to the arch reported a snake sighting in the rumble below the arch; OK, not that I was planning on climbing on the rock, but now I’ll certainly stay clear. The clouds were still breaking up, so there was more blue sky providing the background for the arch, so we had a very nice view of the arch and the surrounding area with plenty of light and color. We rounded the smaller fin that sits in front of Skyline Arch and found the huge pile of rocks that used to be the huge boulder that fell from the arch. That would have been a bad scene if there were folks in the area when the rock fell. We were cautious around the rumble pile, but saw no snakes, which was fine by me. Here's the review for this short walk. plus the track on Ramblr. Back at the parking lot, the traffic continued to pick up, so rather than try to make the left back onto the main road, I just opted to take the short drive to the end of the road and loop back through the Devils Garden parking. Besides, that would let me see how crowded that lot was now that it is around 10:40 AM, which is probably about the time that we had arrived at the Devils Garden when we hiked there in the past. Yeah, sure enough, the place was a madhouse, but the additional parking that had been added seems to be working out very well as there were no cars pulled off the paved surface (so no additional damage to the land…yeah, I know, one could argue that the paving already tore up that part of the land, but having the paved parking should prevent further erosion and additional damage to the terrain along the road. It is just a compromise situation that comes up when park visitation increases). Anyway, lots of folks here, but there were still a few empty parking slots at the far end of the loop. As we still had some time available before lunch, we hit a couple of spots on the way out of the park. First was Balanced Rock. 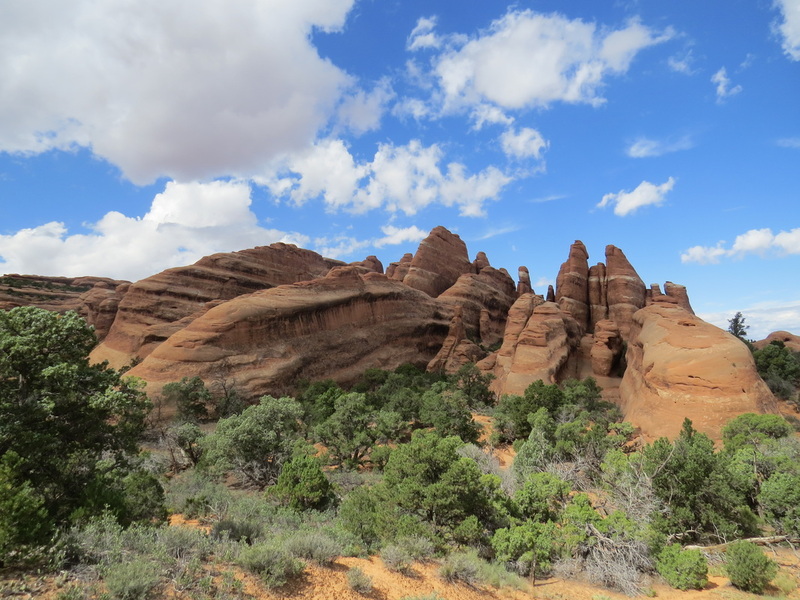 The lighting was not right to recreate one of my favorite vistas from our first trip to Arches back in 2007, so we walked the trail around the great rock and took in the views from all sides. One of the signs along the trail indicated that the rock perched up on that sandstone pedestal weighs 65 tons! I still remember watching the opening scenes of “Indiana Jones and the Last Crusade” with young Indy and the Boy Scouts riding through this amazing desert landscape. That was back in 1989, so way before Lynn and I had started our explorations of the southwest US and certainly before we had heard of Arches National Park. One of the views was of the troop riding in front of Balanced Rock. I can remember commenting that there was no way that was real; it must have been a CGI illusion or something. Little did we know. So we walked the little loop trail around the base of Balanced Rock. Seems that trail has been completely renovated and recently. Nice job again by the Parks Service. The little trail allows you to get views of the monolith from all sides, so there should be some angle with good light. Plus there are nice views in all directions, including over to the Windows Section. We also started our series of “Fun with Lisa” photos. She wanted to get one of the touristy shots of her “holding up” the rock. Why not? So we played around with that for a few minutes. That is harder than it looks trying to get someone positioned just right capture that image. We saw a European family playing the same game with a different image nearby and they were having similar issues but laughing the entire time. 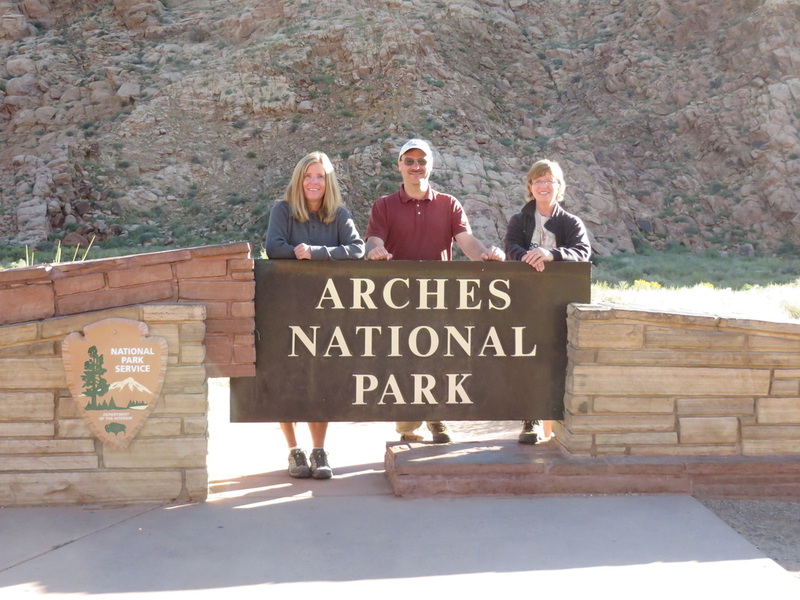 Our next stop in Arches was at the south end of Park Avenue. Lynn and I wanted to at least show Lisa the wonderful view from the overlook, but we decided to head down the trail a bit, if for no other reason to get away from the dozens of tourists who were jammed into the overlook (there was at least one tour bus and the parking lot was pretty well packed anyway…shoot, I was lucky to find a place to park). We made this a short walk and did not go quite all the way to the end as it was starting to get hot as the skies were clear and there is no cover on this trail. But the light was pretty good here in the late morning. While I can see why this area was tagged as Park Avenue, to me the sandstone features have an Egyptian flare. Of course there’s Nefertiti’s Head along the west wall. There is also a spire at the northern end of the west wall that reminds me of stylized Egyptian cat. All that said, there is also a fin along the route that I think looks like a locomotive. So ancient Egypt and a steam engine; no I have not been drinking….yet. Here's Lisa making sure that Balanced Rock stays balanced. View looking down Park Avenue. We ended our walk on the slickrock at the northern end of “the avenue” where we got the big views of the monuments at that end: The Tower of Babel, The Organ, Sheep Rock and The Gossips. There were a few pools from yesterday’s rain, but I could not line up any nice refection shots. Still, the vistas were amazing. On the way back up to the overlook, one of the other tourists asked if we wanted to see a fish. OK, he got me, hook, line and sinker. I thought perhaps he had a critter in one of the pools, but it turns out it was the pool itself. It was in the shape of a fish. OK, that’s sort of cool. We chatted for a few minutes then continued back to the parking lot. Here's the review of the hike as well as the track on Ramblr. Last stop was the Visitor Center. Lynn wanted to see if she could get information on the condition of the road across the Salt Flats to Klondike Bluff. While there was no definitive answer, the guess was that the road would be “iffy” following the heavy rain that came through yesterday afternoon. Sounds like the hike to Tower Arch might be off the agenda for this trip. We were back at Cliffrose about 1:00 and spent some time relaxing on the patio, snacking on cheese and crackers and enjoying some beer and wine. Those two cold bottles of Hop Nosh went down very smoothly. Surprisingly, it rained again this afternoon, but just a light rain, not the torrential downpour that we experience yesterday. I think the rain was actually very localized as the sky was only black right above us; everywhere else was blue sky or fluffy white clouds. There should be a rainbow somewhere, but I could not find it. At 3:00 we headed out to Corona Arch. This was another new area for us. So out the Potash Road along the river and past the rock climbers to find the trailhead. We were on the trail right about 3:30. The rain that was in the area had moved out and we were again under blue skies with warm temperatures. I’ll cut to the chase, this is an outstanding hike. It was not exactly what I was expecting based on comments from friends who have made the hike and other descriptions. I thought it would be a bit more difficult and take longer to get to the arch. The hike to Corona Arch. The first part of the trail is the toughest, as it climbs fairly steeply up a rocky slope from the trailhead to the railroad tracks via a few switchbacks. There is a short level section along the tracks, then the trail climbs again to get to the slickrock bench. I liked the views at the railroad crossing; you can get some interesting shots using the tracks and there are also nice views of the river with the red rocks. Once up on the slickrock, the trail is fairly easy and well marked, but there are a couple of novel obstacles to negotiate, but we’ll get to those shortly. Like so many of the trails we have hiked in southern Utah, I found the trail to be very scenic for its entire length. Nice views of the sandstone cliffs all along the trail. But the trail is exposed, so be prepared for a hot, sunny walk. There are enough cairns along the way to ensure that we were on the right track (and speaking of tracks, you’ll be paralleling the train tracks as they are off to the right down in the valley during the hike to the arch). Speaking of cairns we found another example of the hikers making their mark along the trail. There is another "Buddha Beach" area built on slickrock. This one is not as expansive as the collection of cairns and rock sculptures in Sedona, but it obviously took some effort and I guess has been added to by many hikers over time. But we did not add to the collection. OK, now for those novel obstacles. 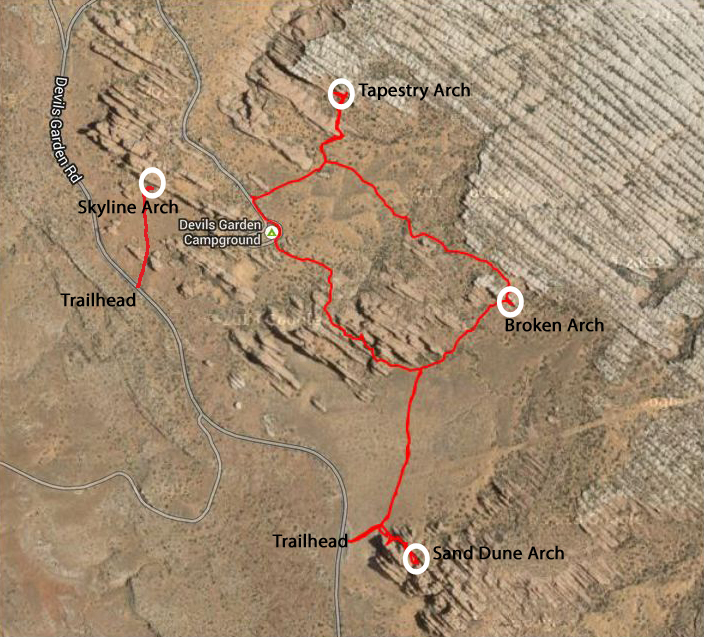 There are three sections of the trail where aids have been added to assist the hikers on their trek to Corona Arch. The first is a cable that runs along the edge of a little pour-off; the cable is there to keep you from sliding down the pour, although it is not a long drop. Personally I thought this set of cables was more of a hindrance than a help. However, that is not the case with the second set of cables. These cables are located at a point in the trail where you get your first views of the arches but also where the trail turns sharply up a steep section of slickrock. To get up to the level of the arches, there are cables along with footholds carved into the rock and then finally a short ladder to get up the final tier. The cables and ladder make the hike a LOT easier (I think that you could get up the slickrock where the ladder is located, but I’m not sure how to get around the section where the cables are used. Doesn’t matter, we made it!). Lynn climbing up the cable. As mentioned, we got our first look at the arches just before we made the climb up the slick rock using the cables. The interesting thing is that I noticed Bowtie Arch first, I guess it was more obvious to me with the light coming down from the top through the arch. I knew that it was adjacent to Corona Arch but I did not see the larger arch at first, so I figured it must be further up the canyon and still out of site. But I did take note of a arch-shaped section in the sandstone to the right of the pothole arch, but it was so well blended into the cliff face that I did not realize what I was seeing until we had made the climb and turned the corner. This is when I figured out that the arch-shaped section was in fact Corona Arch and not just part of the cliff face. Sometimes I’m a little slow. View of Bowtie and Corona Arches from the trail before we reached the second set of cables. We also saw a series of hanging gardens growing in the pour-offs below Bowtie Arch. It is always amazing how the plants take advantage of every water source available in the desert. We completed our hike with a walk under the big arch. We had the place mostly to ourselves for a few minutes. The guys who were in front of us went on around the arch, I think trying to find the trail to the top. 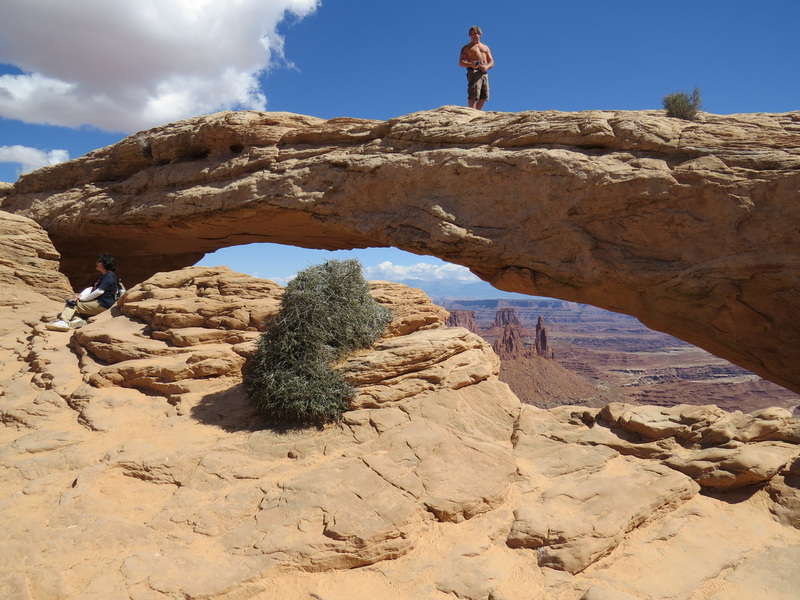 There were no daredevils in the area today, you know, those crazy folks who use Corona Arch as a giant rope swing. So we just enjoyed a few peaceful minutes sitting under the arch and enjoying the desert landscape. The return hike gave us the opportunity to enjoy the scenery along the trail again. Plus there were a few critters to see along the trail. The lizards were out sunning themselves in the late afternoon warmth. We also tried to spot birds in the alcoves along the top of some of the cliffs. There were a few that were obviously used by birds as marked by the white streaks running down from the openings, but no raptors were spotted. We were back at the trailhead at 5:20 so just under 2 hours to complete this 2.4 mile hike (review; Ramblr track). And we were hungry! Next stop, Paradox Pizza. So what exactly are the Jones girls doing? Oh, I see, Lisa is keeping the arch from collapsing! I was hoping to cleaned up and get carry out to eat on the patio, but the ladies overruled me and we just headed straight to the pizza joint. Good call, as we were all hungry after our day on the trails. Also a good thing as we beat the crowd. As soon as we placed our order at the counter, the crowd really picked up; the line was literally out the door. Due to the crowd, it took a while for us to get our food (glad I also ordered a salad, as I got that when I placed the order. I needed some veggies and it was nice and fresh). The pizza was good, but not stellar…but we ate the whole dang thing. I guess we really were hungry (review). We were back at Cliffrose at 7:30. I flipped channels for a bit to wind down for the evening. I think I saw the original “Big Bang Theory” episode; hilarious! I’ve got to start watching that show. Crashed early again (9:00). What a day! And here's the day in photos. 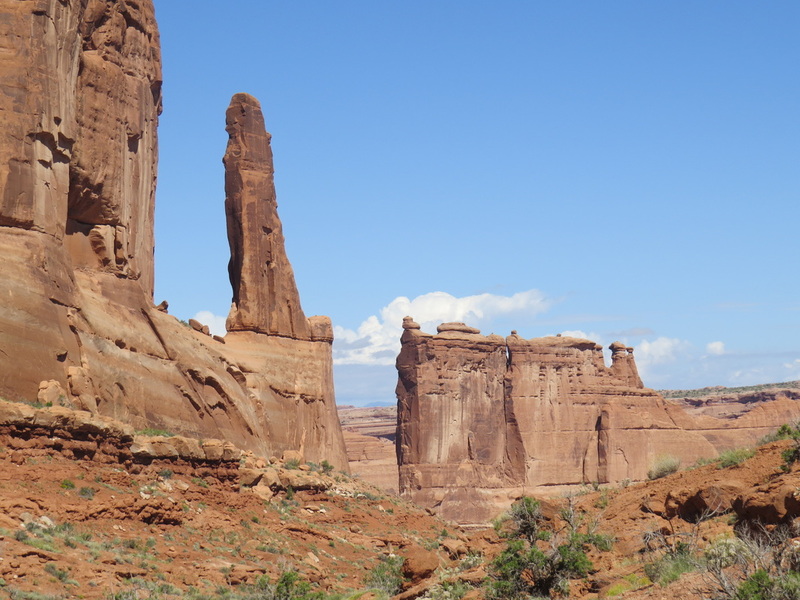 Day 4 – Tuesday, September 23: Arches and Canyonlands. We’re going to give the Windows another shot for sunrise. Maybe the third time will be the charm. This just shows how much time the real landscape photographers have to put in to get “the” shot. My hat is off to those folks. I just shoot whatever is in front of me at any given time, but I digress. Looks like a great morning, clear skies for the most part so we’ll see what kind of light we get at the Windows. The sunrise as we were driving the park road past Park Avenue was simply spectacular. Not a lot of color in the sky, but the light play in the clouds was really beautiful. But the light on the Great Wall was spectacular; I made a quick stop along the road for a few photos. The morning sun makes the Great Wall glow. We were running a bit later than I would have liked, but still arrived in time to get great light this morning and our timing was nearly perfect for the shot of Turret Arch through the North Window. I cruised up the trail ahead of Lynn and Lisa to get to the perch for the money shot. I was waiting for Lynn and Lisa to appear in the Window but they never showed. But there were plenty of other folks in the area, crawling around on the rocks like so many ants. There were a lot more folks here today than the past two mornings. Maybe the good light draws the photographers, like moths to a flame. While over on the perch for the North Window/Turret Arch shot, I was chatting with a few of the other folks who were also looking to get that iconic image. There was one young couple who made the climb bringing just their phone for a camera. They were visiting from Salt Lake where they were attending a conference. They did not have time to see a lot and opted to come to Moab, but mentioned that they would have to come back for further exploration. This sort of turned into a Trip Advisor moment as they asked me about my experience in the southern Utah parks. I told them that for my money they made the best choice given their limited time to come to Moab and check out Arches as it is one of my all time favorite parks just for the surreal nature of the landscapes and because it can be explored in a relatively short period of time. Am I digressing again? Anyway, I took a few more shots of Turret Arch through the North Window, including a couple lucky images with no “ants” in the frame (you sort of need a person in the image to provide perspective but too many tourists just detracts from the view). After climbing down from the North Window perch I found Lynn, but Lisa had wondered off to explore the primitive trail, so we just worked our way back down to the truck which I had parked near the end of the trail…just dumb luck. Lynn and I started up the trail to meet Lisa but she appeared just a minute later, so we all just headed back to the Explorer and loaded up. On our way out of the park we made a quick stop at one of the pullouts above The Organ for a photo op and finally at the park entrance sign for our “passport” photo. Lisa at Turret Arch (nice shot by Lynn). Turret Arch through the North Window. Our "passport photo" at Arches. Back in Moab, we ditched the truck and our gear at Cliffrose and then walked into town for breakfast at Peace Tree. I reckon it was about 9:00 when we arrived. The place was busy, but not packed and we were immediately seated on the outdoor deck, I think at the same table we sat at two years ago with Frankie, Alex and Paula..and the M&Ms of course. The breakfast menu offers a nice selection of choices that range from the classic to eclectic with a southwest flare. Since we were going to be hiking later today, I was not looking for a huge meal, even though I was eyeing the smothered burrito. I asked the server and she said it was "mondo." OK, what is the second choice? The girls both opted for the coconut–crusted French toast which was tempting, but I finally settled on the classic bagel with ham and pepper jack cheese. It was good, but actually had too much cheese. Still it was a tasty meal and gave us fuel for the rest of the day (review). We were back at the house about 9:50 and got our act together for further exploration in the area. We’ll spend the rest of the day over in the neighborhood of Canyonlands Island in the Sky, starting with the view from Dead Horse State Park, I mean, Sleeping Horse State Park (sorry, Ziggy!). Like just about every road around Moab, the drive out to Canyonlands and Sleeping Horse Point is very scenic with lots of great sandstone formations along the way. There’s also a fair amount of drilling going on along the road on the BLM lands (oil or gas, I suppose). So we just drove out to end of the road to take in the views from Sleeping Horse Point. I reckon we arrived in the parking lot just about 11:00. The place was packed so I had to try and jam the Explorer into a tight spot along the shoulder, which just wasn't working out, but fortunately I spied a car pulling out of a parking slot just head so I got it in gear and snagged it. By the time I had parked, someone else in a much smaller vehicle had claimed the spot along the shoulder and that car fit very nicely. All’s well then. We just walked a portion of the trail long the rim of the point, just taking in the views. The vistas looking out over Island in the Sky are quite impressive. The views just seem to go on forever. The bright blue evaporation pools from the potash mining operating are very conspicuous from the point as well. The blue of the ponds is a stark contrast to the red and brown of the surrounding landscape. Turns out that the color of the ponds is due to a dye that is added to speed the evaporation process (at least according to Wikipedia, so it must be true). I think that Lisa had a true “ohhh–ahhh” moment as she looked out over the brink at the canyon, but then who doesn't when they first see sights like this. I have those types of moments about five times a day when in southern Utah! We did have a couple “stupid people tricks” sightings today, the first was a lady who climbed over the wall to get to the edge of the canyon for a better photo. I’m thinking that the photo she took was no better than the one I got from the safe side of the wall. What is it with people? Here’s the scene: paved trail, stone wall, sandstone ledge, sheer cliff, 800 feet of air to the canyon floor and certain death. Gives me the willies. But the ledge was wide there and she really was nowhere near the edge, so no real danger in this instance. But still the wall is there for a reason; could have been an unstable ledge. I mean, we all take risks everyday, but why tempt fate. There were also a couple of young ladies, I think from Eastern Europe somewhere by their accents, who were "modeling" on the rocks near the rim. They really weren't in any danger, other than the scramble up the pedestal they were using for their stage. They were just fun to watch as then varied between playing super model, gymnast and yoga instructor. I saw them again further on along the rim posing on another set of rocks. The imposing canyon made a very nice backdrop. I reckon there are lots of ways to enjoy the natural wonders of the parks. Lisa at Dead Horse, er, Sleeping Horse Point. There's the Schafer Trail meandering down the cliff face. From each vantage point along the rim we had wonderful views. The cars traversing the Shafer Trail and the White Rim Trail through and around Canyonlands looked like ants as we watched them from hundreds of feet above the canyon floor. I used the reach of the SX50 to zoom in on the vehicles and watch them crawl along the rough spots of the road. While there certainly was no traffic jam, there were several vehicles trudging along the road, all pick-ups and SUVs, at least as best as we could tell. 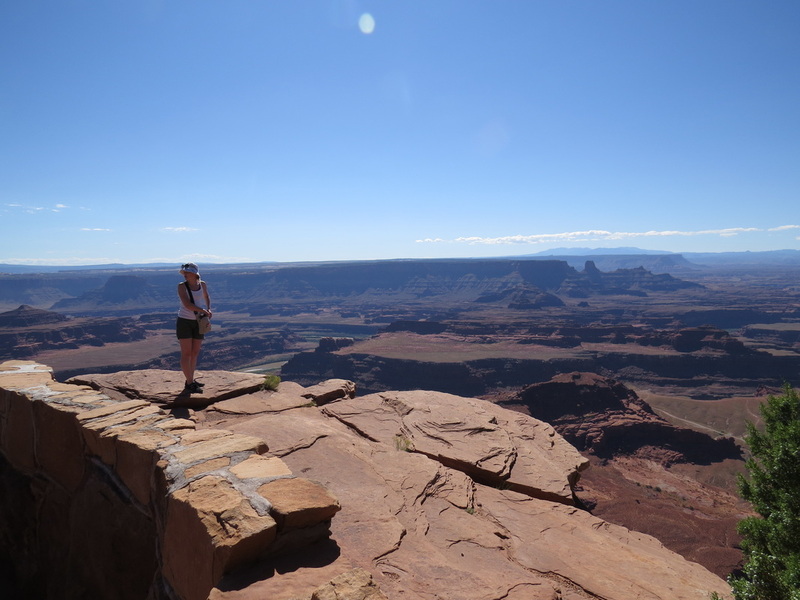 We finished our short walk along the rim then saddled up and headed on to Canyonlands. As was the case with Arches, there was no one manning the entrance station, just a sign to stop at the Visitor Center to pay and get maps. Well, with an annual pass, I was not worried about the pay part, but we did want a map, so we made a quick stop. Lisa went in the VC as well and we made a quick tour of the displays. Hiking out to False Kiva was the primary objective for this afternoon, but we were still a bit early for that, as later in the afternoon is supposed be provide the best light. So we made a couple other stops. 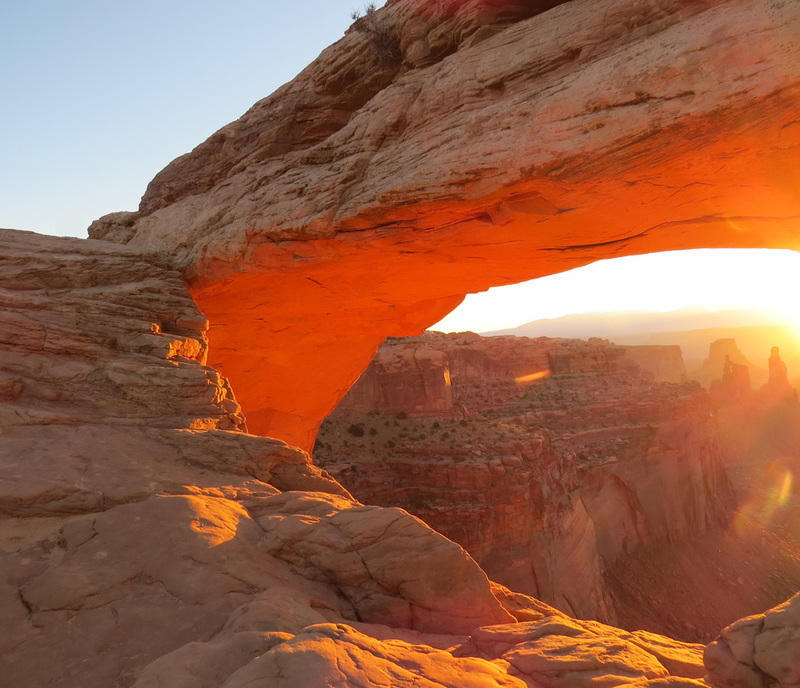 First was Mesa Arch, a classic sunrise photo op, but a great view any time of day. We walked the short loop trail to the arch, going counterclockwise. I stopped and took in the views as the trail started to climb over the small hill. The colorful hills were too far away to make a great image, but I liked the single line of puffy white clouds in the otherwise clear blue sky. I enjoyed the vista for a moment the scurried on up the hill to catch the girls. The loop trail to Mesa Arch. On around the trail to the arch and the view was just spectacular. I’ve been toying with the idea of trying the sunrise shot here during this trip, but the cloud cover we have had so far would most likely have meant a washout in terms of getting the desired orange glow on the underside of the arch. But the weather is supposed to be clear for the next couple of days and seeing the arch again is getting me thinking that perhaps I’ll give it a shot tomorrow morning. So I spent a little time looking around the arch for what might be a good location for getting that sunrise glow. But even now at nearly 1:00 in the afternoon, the view is still amazing. We all played around with using the arch to frame the sandstone formations in the canyon below. Along the trail to Mesa Arch. Lynn's view under Mesa Arch. There were folks coming and going from this vista point. Even in a place so full of natural wonders, I’m still apt to do a little people watching…like the “super models" back at Sleeping Horse Point. So I noticed this short, stocky, shirtless dude with a couple of big tats and a baby carrier backpack and his young wife in tow (I'm assuming she's his wife). Not sure why I noticed them; maybe I was thinking that the backpack looked uncomfortable without a shirt but he had a rough, outdoorsman demeanor and did not seem to care, maybe it was the Hawaii 5-0 tattoos, or that he was 20-plus years older than the young woman he was with. Whatever, they passed out of view and out of mind. Well, until a couple minutes later, when there he was again, on TOP of Mesa arch. What the heck is he doing! I was immediately looking to see if he still had the baby in the backpack, but fortunately the pack and baby were on the sidelines with the young woman. OK, if he drops he’ll only be taking himself out of the gene pool. He walked the entire span of the arch. OK, he looked like a tough, outdoor-type dude and survived the walk and seemed perfectly at ease, but that is no excuse, that was just a dumb move. And I later found out that walking atop any of the named arches is illegal (so I was in the wrong for walking up the fin toward Private Arch, I reckon). But there were unintended consequences from tough dude’s exploit as an older Asian gentleman decided to give it a try. Old Guy looked completely terrified out there. Where Tough Dude walked the entire span of the arch, Old Guy fortunately turned back after just a few steps out on the arch. Tough Dude’s actions could have resulted in big problems. 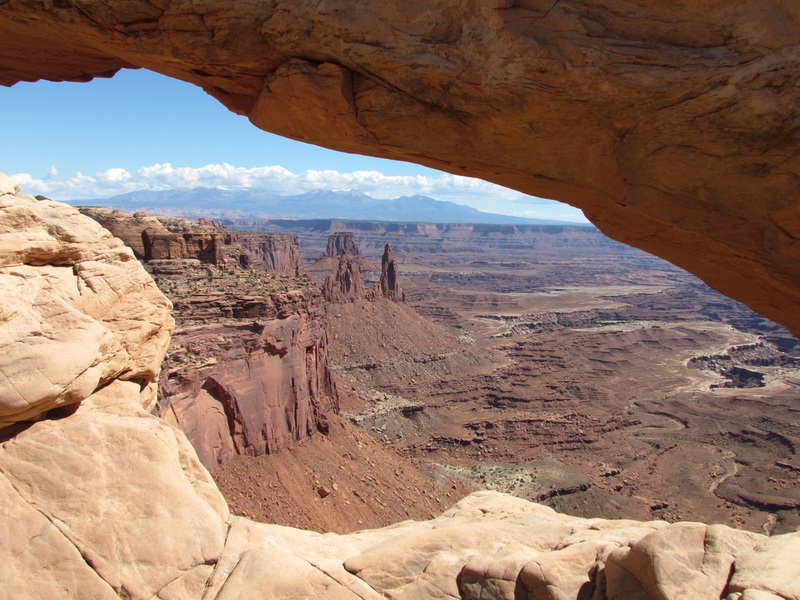 All’s well that ends well, but it could have been a bad day in Canyonlands. Here's the review of the hike plus the track on Ramblr. Wrong side of the wall. Tough Dude on Mesa Arch. We next cruised out to the end of the park road to take in the vista at Grand View Point. The views here provide a great perspective on the layers of the canyon and the overall geology as well as the reasoning for the naming of the White Rim Trail, that being the light colored (almost white) rocks that surround the edge of the canyon. We again watched a few folks driving slowly along the White Rim Trail. In fact, we saw some hikers and bicyclists using the SX50 (hey, it makes a pretty good spotting scope). Of course the biggest excitement was caused by the snake that crossed the trail near us. I group of Australian tourists noticed the long reptile; one of the tourists estimated that it was well over a meter in length. I later got a glimpse of it as it slithered out of view; it was greenish with yellow stripes running the length of the body, perhaps a striped whipsnake. We decided not to walk the entire viewpoint; the vista from where we were standing was more than good enough for us. Now it was time to see if we could find False Kiva. The vista from Grand View Point overlook. 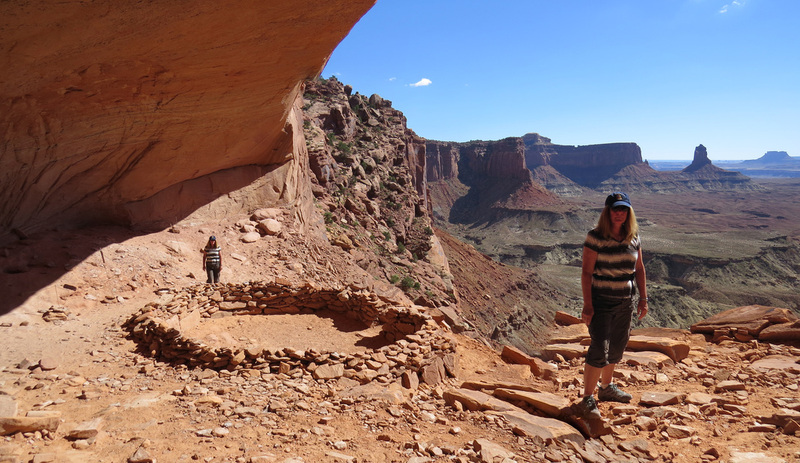 False Kiva is not on the park map; I don’t think that the trail is officially sanctioned or maintained by the Park Service in order to reduce the traffic and thus hopefully protect the ruin site. But the word is out already. I had read about the site in “Photographing the Southwest, Volume 1 – Southern Utah” by Laurent Martres. He provides a very good description of the trail and directions to the site. It is just a paragraph but very useful. Rather that carry the book on the trail, I snapped a quick photo with my phone for easy reference. The directions in the book were dead on and lead us right where we were hoping to go. But the trail was also very well marked and well worn; there were scores of cairns lining the way as well as plenty of boot prints from previous visitors. Our route to False Kiva. We were on the trail at 2:10. The hardest part of the hike was finding the start of the trail. Per the book, we parked at the Alcove Spring parking area, then walked back down the road to find the trail. The trailhead is about 250 yards from the parking area on the opposite side of the road. There is a fence of sorts made of old juniper branches. Just walk to the far end of the fence to find the unmarked trail. Once on the trail, we had no problems following the route to our destination. Honestly I was expecting a much more demanding time navigating to False Kiva as well as a tougher hike, but the directions from the book and the unusually high number of cairns made it a breeze to find our way. 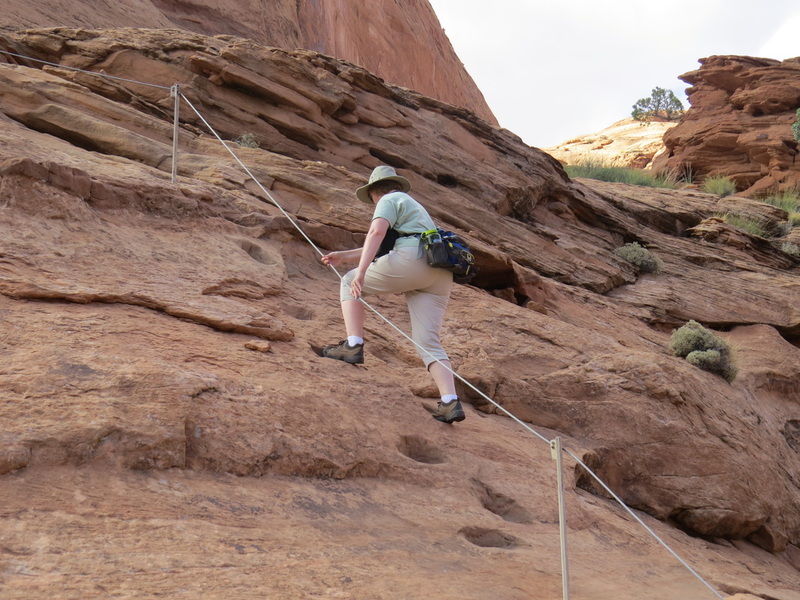 The trail itself is not overly difficult, but there is a steep hill to negotiate to get into the canyon then a final uphill bit and a little scramble to get into the alcove that conceals False Kiva. We did not see anyone else on the trail until we were started down the steep hill and could see the large alcove. There were four other folks down there, seemed on one pair was coming our way and the other was heading into the large alcove and up the trail to access the kiva. We talked to the couple coming back our way for a bit (we found a shady spot to take a rest, so the timing was just right). He was from New York and his wife was from Columbia and they were hiking here as part of their 20th anniversary trip. They said that the spent a lot of time on the trail today adding cairns as they did not think the trail was marked well enough. Well that explains all the cairns and certainly was a big help for us. Lynn’s knee was bothering her, so she did not make the last climb up to the alcove with the kiva, but she still got the great view of the valley from her shady perch under a tree along the trail. Lisa and I went ahead and made the final climb to the alcove. I had to coach Lisa a bit to get over the last little scramble but we did make it to the alcove. Let me tell you, it was well worth the effort. 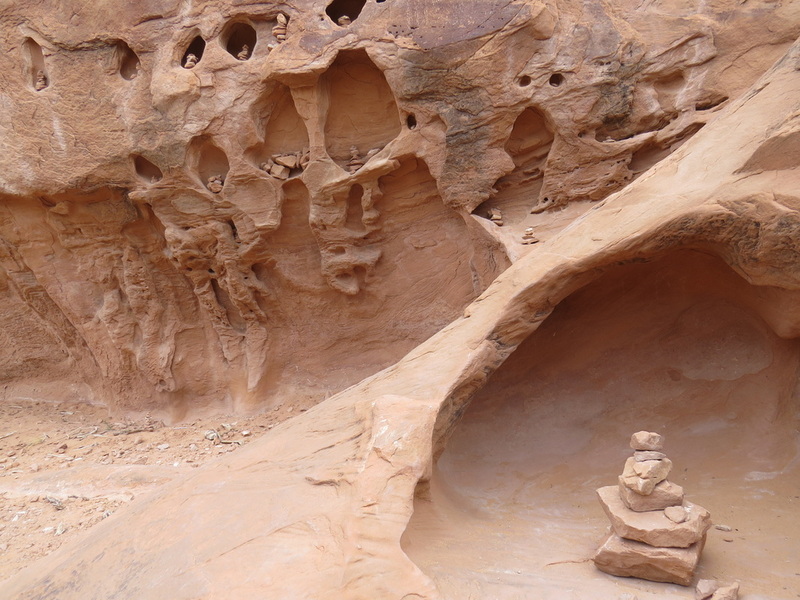 According to the time stamp on the photos, it took us just under an hour to reach False Kiva. What a view! It is sort of a surreal image standing in the back of the alcove looking out over the sandstone formations in the canyon beyond with the ring of rocks perched in the foreground near the edge of the cave opening. Lisa and I explored the alcove a while and of course snapped a few photos. The sky was almost clear blue with just one little puffy cloud floating by, so decent light, but lacking a little in terms of interest (some of the photos I’ve seen had interesting cloud play in the background, but then again, I’d rather give up a little in terms of interesting clouds rather than risk an afternoon thunderstorm). The view from the False Kiva alcove. More photographic fun with Lisa. The hike back was uneventful. Lynn was waiting in the shade right where we left her. We took our time climbing up the slope and made a couple observations on the way. First was heart-shaped formation above the big alcove. We also spotted some interesting “fossils” in the sandstone along the trail, perhaps from ancient plants (this is a total guess). Anyway, we were back at the Explorer about 4:10 so roughly a 2-hour excursion. We saw maybe eight other folks on the trail, some on the way in, and some on the way out. Another group just starting in when we got to the trailhead; this was obviously a group of photographers from all the camera gear they were lugging along with them and while they looked like they were ready to get great images, they did not strike me as hikers. I was a bit surprised to have seen so many hikers as the description in the book indicated that generally there is no one on the trail. But we were alone while at the kiva, which was pretty special. I posted the track for the hike on Ramblr. I'm not sure what the four circles are. Last stop in the park was at the Schaffer Trail overlook which provided great views of the switchbacks heading down into the canyon. 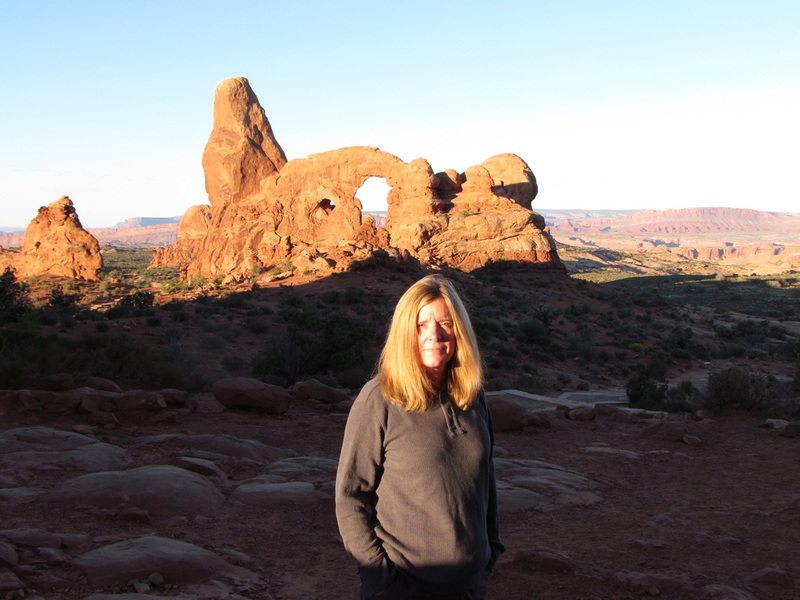 Lynn regaled us with her recollection of the drive we took down that road during our first visit to Moab. We had booked a sunrise photography tour through Canyonlonds. As part of the tour, our guide took us down the Shafer Trail in his rattle-trap Jeep. As we are going down the steep section with all the switchbacks, he was holding hsi coffee cup with one hand, pointing out the window with the other and paying more attention to trying to spot dinosaur bones that driving. Lynn was not a happy camper and has often said that this was one of the few times that she would rather have gotten out of the vehical and walked down to the bottom (I'm guessing another was our drive down Moki Dugway). It was not pretty. For dinner, we headed to Moab Brewery. The wait was only 20 minutes, but there was first-come-first-served seating in the bar, so we opted for that. The beer was average at best (Johnny’s IPA was lame; the Red Rye IPA was better but still just OK). The service was also lackluster. Fortunately the food was good (review). We were back home in time to catch most of NCIS (a favorite for both Lynn and Lisa). I took a few minutes to get my gear ready for an early morning departure to catch sunrise at Mesa Arch, then headed off in search of the Sand Man. Here are the photos from our adventures today. 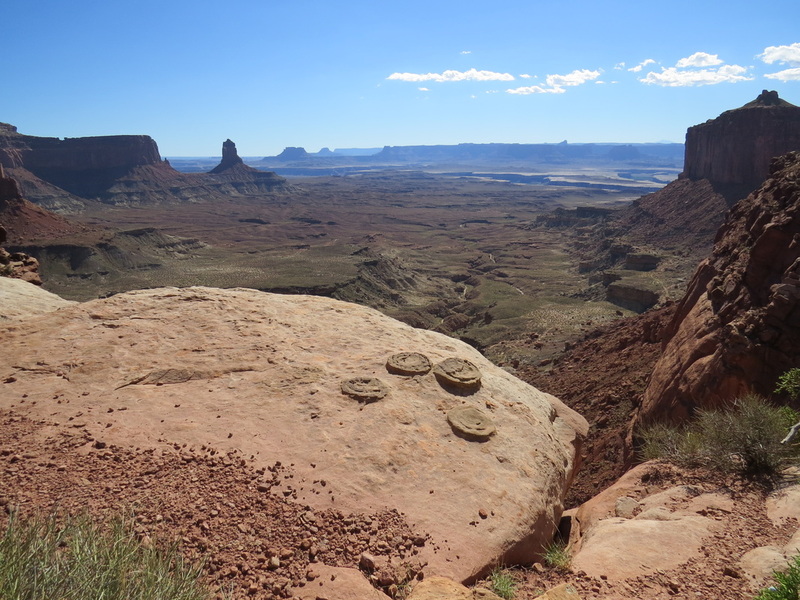 Day 5 – Wednesday, September 24: Heading to Green River. I woke up early, pretty much like the past few mornings. Since I’m up, I might as well give sunrise at Mesa Arch a shot. Sunrise is at 7:07 this morning, so I have plenty of time to get there. The standard advice is to arrive about an hour ahead of sunrise in order to get a spot to set up for the shot. I guess I was on the road before 5:00. No traffic through Moab or on route 191 heading north, but I encountered a few cars on the road to the park. I guess there are a few other folks looking for the sunrise shot. A couple of the cars ahead of me turned out the Dead Horse Point; OK, a little less crowded at Mesa Arch. Yesterday while driving through Canyonlands, Lynn noted the very winding nature of the road as we approached the parking area for Mesa Arch. I think she called this stretch “the squiggles.” I used that as a marker to find the parking area which did keep me from passing the entrance. I guess I was at the parking lot at 5:45. There were only two cars in the lot when I arrived, but two others and an RV pulled in right behind me. As I have simple and lightweight equipment, I was on the trail well ahead of the other new arrivals. The trail is easy to follow to start, but use caution the closer you get to the arch as it is easy to lose the trail, as I did. But I was quickly back on track. Unlike our visit in 2010 when there were about a dozen photographers already arrayed along the arch, I was the third to set up a tripod this morning, so I got a choice location. Now it is just a wait to see if the sunrise is worthwhile….and how crowded it gets at the arch. So the group of photographers slowly grew as sunrise approached. For the first 30 minutes or so, there were about eight or ten photographers and we spent the time chatting. The pros (or at least really serious amateurs) with the “big lenses” talked camera settings, how many shots will be layered to get the final image and other technical topics. Turns out that of the group there, only me and one other guy had been to Mesa Arch for sunrise before; that was sort of surprising. We also talked about other photo ops in the area. False Kiva came up; turns out that one of the guys was there last night to get the star field in the image. Now that is not a hike that I would want to make at night. He just stayed up and came straight here. That’s dedication…or crazy. Similar story from the lady who setup next to me. She was making a whirlwind tour through the area getting to some specific photo locations. She was at Goblin Valley yesterday and also stayed up to get the star field with the goblins. She said she had left Goblin Valley at 0300 to be here for sunrise. The crowd really started to pick up just before 7:00. There were a lot of folks who arrived just before the show started. I reckon there were about 30 folks along the arch by now. There were no tour buses this time around but there were a few Asian tourists and they were all trying to squeeze in between and in front of the tripods that had been in place for well over an hour. Fortunately everyone else was willing to share and be polite. The sky was clear this morning, so the light was great. Very nice glow on the underside of the arch once the sun breached the La Sal Mountains. But there was a lot of glare until the sun moved up behind the span of the arch. Everyone was just snapping away with their cameras and by about 7:30 most folks were packing up to leave. I went hand-held at this point and got some shots from various spots along the span of the arch, as did a few of the other photographers. I actually thought that the glow under the arch was better now, about 30 minutes after sunrise. After the show, I went around to the left and got shots “in front” of the arch. Actually found some pretty good views of the front of the arch but to get the best views I needed to be closer to the edge. Well that’s not something I’m good at. So I sat down and scooted out toward the edge a bit, quite death defying for me, but I got that better angle I was looking for. OK, maybe that was my stupid people trick for the trip. But I really enjoyed the quiet over in this area. I sat on the slickrock and just took in the morning and watched the cliff swallows swooping around catching their breakfast. For a few minutes, I had the whole park all to myself. After a while, I walked back over to the arch. The crowd was gone. A few new folks had arrived and were posing in front of the arch. There was still some light on the underside of the arch. I captured one of my favorite images of the trip at this time, with the blue mesas in the distance framed by the red of the arch. It has a bit of a different look to from the other shots I got that morning, sort of an Art Deco feel. Well, whatever, I like it. The morning glow on the underside of Mesa Arch. My favorite view from this sunrise expedition to Mesa Arch. I collected Lisa at her hotel then headed back to Cliffrose to rendezvous with Lynn. We then walked to the Jailhouse Café for our final meal in Moab before moving to Green River. Since we had a bit of a wait for a table, I quickly walked back to Cliffrose to get a jump on the packing. I got a lot done in those 15 minutes. I was back at Jailhouse right after the girls were seated. Sort of a limited menu, but there was a few options that sounded very good. I went with the bacon, cheddar omelet. Unfortunately, that had to be the thickest bacon I have ever eaten; it was really too thick and overdone as it was overly chewy (review). Overall, I like Peace Tree better. After breakfast, I dropped Lisa at her motel then we all finished packing. Lynn and I really enjoyed our stay at Cliffrose Flats; I think we have found our go to lodging for future visits to Moab (review). It was perfect for our needs, but now it is time to move on. We were all packed, loaded and on the road at 10:40, which was too early for the State Store (opens at 11:00). So we killed some time by driving south out of town on route 191, checked out the Moab Man panel, fueled up the Explorer, and then returned to get some high quality beer. The girls wanted to go to Castle Creek Winery, so that was our next stop. The nice thing about this was it gave us an excuse to drive out route 128 again, plus it would put us in line to make the detour up Sego Canyon to look for some rock art panels. We stopped at Fisher Towers trailhead, but too hot for a hike. So we just admired the view for a while then continued our drive to Cisco then on to I-70. This is probably a good place to transition to the Green River part of the trip as we’ll be getting a head start on the meet-up with our trip up Sego Canyon. Here are the photos from today (Mesa Arch as well as the trip to Green River). The journal and the journey continue here. View back out over the Colorado River valley from the Fisher Towers trailhead parking area.